Born St Louis Missouri I realized at a young age that I process the world through my hands. While drawing, painting, sculpting and sewing I work through and make sense of my life as it unfolds. For me it is a natural way to examine and get closer to my experience. I follow my intuition developed from a deep fascination of epigenetics, alchemy and ancestry along with my connection to the natural world to guide the imagery in my work. 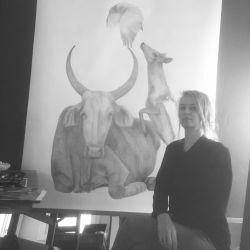 The mirror images of animals in my pieces are a personal study into the relationship of being an identical twin while the lone creatures represent my work with identity separation. The groupings I paint of the dance of our ancestors are about our connection to them and everything around us. I use animals as my main subject matter because they have a purity and beauty to me that help me observe without a narrative. In this deep trust my heart opens. Here I can break down shape into its simplest form of light and shadow and at the same time observe my singular interpretation based on my own life experience and ancestral influences. It is during this pairing down process that new layers come into awareness and l finally become still. Here I am left empty and can witness the process of creation itself. Meagan lives in Oakland with her daughter Ada.